Jim Thomas’ clients describe him as genuine, warm, open, compassionate, and able to give and receive feedback. He adds a touch of humor and an interactive approach. He enjoys working with couples, families, individuals, and organizations from a strength-based, holistic approach. Jim’s even been known to sing a few bars from a song in session He loves his work. Jim obtained his Bachelor’s Degree in psychology from the Ohio State University. 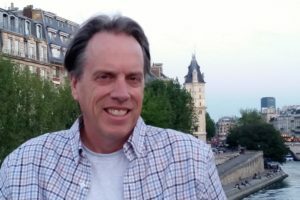 He studied alternative approaches to psychotherapy for two years at Boulder College, and earned his Master’s Degree in Clinical Psychology from the University of Colorado at Denver. He is a Licensed Marriage and Family Therapist, EFT Therapist, and an AAMFT, Clinical Fellow and an AAMFT Approved Supervisor as well as an ICEEFT EFT Supervisor. In 1990, Jim joined the Colorado Institute for Marriage and the Family for Post-Graduate Training in couples and family therapy. His mentors there, Jan Raynak, MD, and Suzanne Pope, Ph.D., taught him the importance of co-creating meaningful experiences for clients in the therapy session, going beyond appearances to the heart of a relationship. Suzanne modeled the importance of emotions in relationships.Jim stayed on as a faculty member from 1993 to 1996. His focus on connection in families and couples led Jim to the work of Sue Johnson, author of Hold Me Tight. Jim also had the good fortune of being able to receive individual supervision from Sue Johnson and Gail Palmer in Emotionally Focused Therapy (EFT), and he continues to be actively involved in the EFT Community as an ICEEFT Certified EFT Trainer and a member of the ICEEFT Strategic Planning Committee dedicated to spreading the word about EFT. From 1998 to 2002, Jim served as President-Elect, President, and Past-President of the Colorado Association for Marriage and Family Therapy (CAMFT). His peers elected Jim Chair of the Council of Division Presidents for the American Association for Marriage and Family Therapy (AAMFT). He served on the national board of directors for AAMFT. He presented workshops or facilitated strategic planning for the Alaska, Michigan, South Dakota, and Washington Associations for Marriage and Family Therapy. He also teaches EFT at Denver Family Institute. Jim left agency work to start the Institute for Change, P.C., and Engaging Trainings. His consulting work includes Shining Mountain High School in Boulder. He has consulted with Aurora Mental Health Center, Mental Health Corporation of Denver, Shiloh House, Community Reach Center, Dignity Program for Girls, Shepherd Valley School, and Emerson Street School. He provides Hold Me Tight workshops to Denver Police Department Officers and their significant others. In 2002, Jim joined the faculty at Denver Family Institute (DFI) an accredited couples and family therapy training program moving in to leadership as the Executive Director shortly thereafter. Director Steve Litt, LCSW, said, “We had a strong program. I wanted to turn direction over in a thoughtful way. I was looking for a passionate marriage and family therapist with leadership skills. He saw new possibilities for DFI. I am thrilled with how he helped us to grow and thrive together.” In five years, DFI tripled in size serving more families than ever. 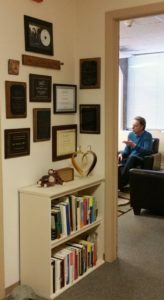 He turned the reins over at the end of 2011 to focus on developing the Colorado Center for Emotionally Focused Therapy in a cooperative affiliation with DFI. Jim sees these diverse professional activities as linked, “All of my work focuses on helping people to be more fully aware and engaged in their lives. I accentuate their wholeness and strengths while dealing with real issues. When people connect more deeply with themselves, they can step beyond self-imposed limitations. That allows deeper connection with others and a richer life. Watching people grow, I feel blessed to do this work.” Jim is now a Director Emeritus of the Denver Children’s Home. Note: Colorado Center for E.F.T. is the Institute for Change, P.C. doing business as the Center.